Replaces barrel vice and totally secures and protects receiver during removal and replacement of barrel assembly. 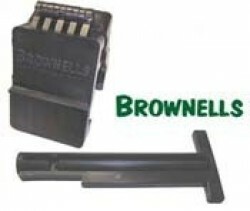 Totally eliminates any possibility of damage to barrel detent pin or receiver detent notch. Fits all model Mil. Spec. receivers and is made of high pressure structural vinyl foam. Torque tested to over 200 ft. lbs.! Patent Pending.